NPA Explosive Detection Dogs in Siem Reap is an exclusive experience brought to you by Norwegian People’s Aid. We are a global non-profit organization committed to ridding the world of landmines and other unexploded bombs that litter the land after the end of a conflict. If you are a canine lover or want to learn more about how we train our dogs to do life saving work out in the field, then this is for you. Its a great activity for the whole family where you will be able to witness first hand the Belgian Malinois in action as they complete a series of training demonstrations and obstacles. You are able to meet these intelligent dogs and their handlers, learn and support the work of Norwegian People’s Aid in Cambodia. Why do we use dogs in this work? Dogs are recognised as one of the most effective ways to speed up the painstakingly slow process of removing landmines and unexploded bombs. Dogs are particularly efficient in locating unexploded bombs due to their incredible sense of smell and ability to be trained to work well with people as you will soon see. The dogs are trained to find the explosive and ignore all other metal scraps that litter former battlefields. NPA opened a Dog Training Centre in Siem Reap in response to the growing demand for explosive detection dogs. 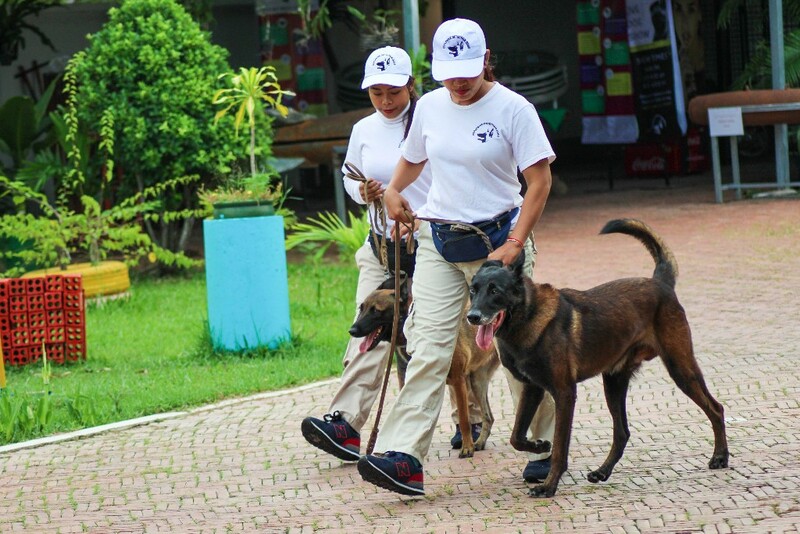 Dogs trained in Cambodia will help to finally clean up the widespread unexploded bomb contamination in the South East Asia region. Our dogs are incredibly smart and strong. Most importantly, our dogs protect people’s lives, render land safe again, – for people to live on, to work on, to cultivate and to grow a future. Come visit us and meet our friendly life-saving dogs and their expert handlers in action! We visited the Explosive Detection Dog Show in September 2017 and had a great time! Not knowing what to expect, we were immediately welcomed by the staff, who explained the itinerary for the afternoon. The show started with a short documentary about the still ever-present problem of landmines in Cambodia. After which we could ask questions and were introduced to the demining dogs and their (Cambodian) handlers. The show itself consisted of a series of tests in which the dogs showed off their skills with a lot of enthusiasm. There was a explosive detection test, obstacle course and synchronized obedience test, all executed flawlessly by the dogs and handlers who worked together as a well-oiled team! After the show, there was time to mingle with the dogs, talk to the handlers and take photos. All in all, we had an unforgettable afternoon and we highly recommend attending the show. It is a unique experience and even better, you’ll support a great cause, as all proceeds go to the training of demining dogs, which are doing their best to make Cambodia completely landmine free in the near future! A fantastic way of learning about the good work NPA does for countries like Cambodia; clearing landmines with the help of dogs. The “show” is setup very well, though I’d rather call it an interactive learning experience as you get up close with the dogs and their handlers. The dogs are super well trained and it’s amazing to see their bond with the handlers. Keep up the good work!